I’ve been thinking about getting in some sort of sports league lately. One to be social but maybe a little active. So I joined a bocce ball league. Spoiler alert: My team isn’t going to win this league. Didn’t know people played bocce ball in Omaha? And they’re like, our age? 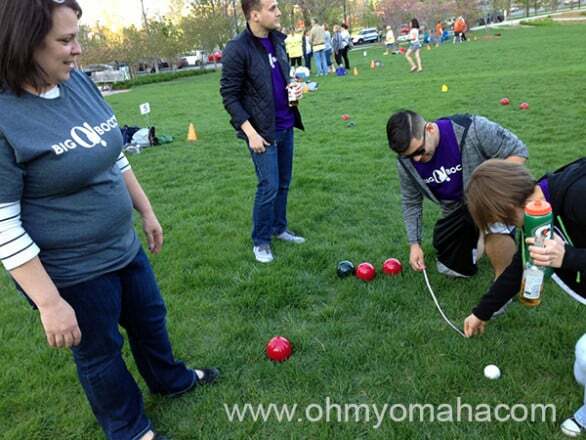 There are 70-odd teams in the Big O Bocce league at Midtown Crossing this spring. 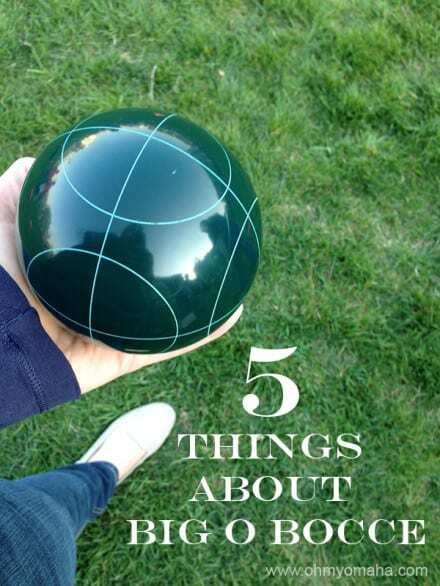 Bocce ball is not a physically demanding sport, and can be played with a beverage in your hand – making it appealing to older folks and college-aged kids alike. 1. Anyone can play it. I’ve never played bocce ball until last Tuesday. 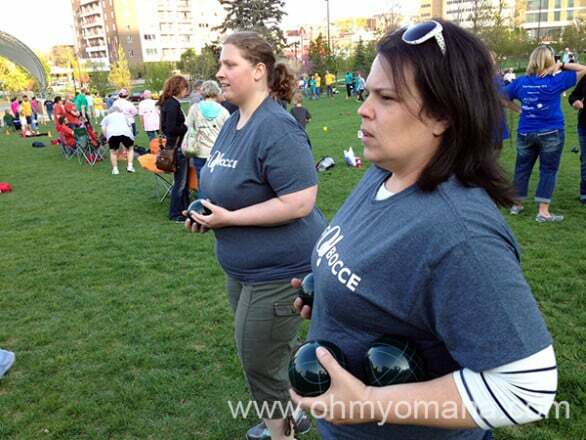 Nor had any members of my glorious bocce ball team, Joanie Loves Bocce, played. We had to google how to play. So you can bet we were worthy adversaries. Luckily our opponents had never played either, so there wasn’t a whole lot of pressure. In case you were wondering, we lost to Balls Deep. I’ll let you come up with a joke right here. Joanie Loves Bocce has serious game face, though. Take heed, though, there are some competitive souls out there. 2. Anyone can play it but that doesn’t mean everyone’s good at it. There is some skill to bocce, so even though we can all throw a ball, it’s not so easy to master. Being a competitive person, I had a hard time coming to terms with this. Kim wants to win. Put two and two together – sports and a public park – and you wonder if alcohol is involved. Well. Yes and no. People brought coolers, people purchased beer from Brix. But, it’s a public park so no one was throwing a kegger in Court No. 3. Everyone seemed pretty responsible, but having fun. Not only can you play with a beverage in hand, you can pretend to measure distances as well. 4. The real fun is afterward. Sponsors of Big O Bocce – Cantina Laredo, Black Oak Grill and Chicago Dawg House – rotate offering post-game specials. We went to Cantina Laredo last week, and they offered $2 tacos and $2 Tecate beers. I’m excited to see what the other places will offer teams. 5. Summer league is on the horizon. Will Joanie Loves Bocce be back? Who knows. But if you’ve got 5-8 friends, pool together your registration fee of $35 each and join the summer league. 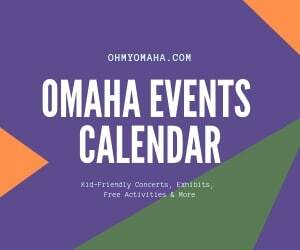 Registration starts May 25. You guys get a tshirt and an invite to the end-of-the-year party, and if you’re any good, maybe a trophy. Top scoring fees get money to donate to charities of their choice in addition to a trophy. Disclaimer: I was provided complimentary registration in exchange for telling you about Big O Bocce. It was kinda unspoken that I wouldn’t tell you any rules or provide any “how to” tips because clearly, I have no idea what I’m doing out there. How fun! 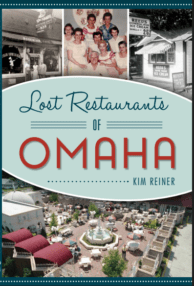 I love stuff like this in Omaha. How fun! I need to come watch and cheer you guys on sometime! !